Tiger skins as well as Chinese medicines containing tiger and rhino parts confiscated by the USFWS at the Los Angeles Airport. The first-ever summit dedicated to a single animal brought world leaders, officials and conservation groups to Russia last week. 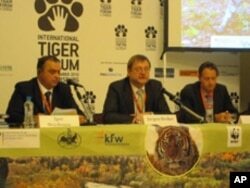 The International Tiger Conservation Forum in St. Petersburg convened in the waning days of the Chinese Year of the Tiger. Tigers are in serious trouble. Habitat loss and poaching have taken their toll. Only 3,200 are left in the wild down from 100,000 a century ago. At the summit the 13 nations with tiger populations endorsed the Global Tiger Recovery Program. The document details action plans for each country and region where tigers survive in the wild. Germany's Deputy Minister of Germany's Federal Ministry of Environment Juergen Becker addressing the Tiger Summit in Moscow. "What the summit achieved was all the countries endorsing this Global Tiger Recovery program, which means that we now have all the heads of governments of the 13 countries agreeing to one single plan moving forward toward tiger conservation," says Barney Long, who manages the tiger program for the World Wildlife Fund, a key player in tiger conservation. He says the plan is a positive step forward for tigers. The world leaders also agreed to double tiger population by 2022. But their most immediate priority is to stop illegal poaching and trafficking by organized crime syndicates. Tigers are sold for tens of thousands of dollars on the black market and marketed largely in South Asia for their skins, parts and meat. Long says while the demand for products used in traditional Chinese medicine has decreased since a 1993 law in China banning their sale, there's increased demand for use of tiger bones in tonic wine and tiger meat. "Both of these are really status symbols." Another major obstacle to tiger recovery is the loss of their habitat. The land has been taken over by farmers and large plantations, and eroded by roads, dams and mines. Long says wildlife managers must look across the economy for solutions to repair the tiger's fragmented landscape. "They need to be working with planning industries and transportation ministries and energy ministries. Get countries to look at the holistic picture of sustainable landscape conservation, and obviously this kind of approach is not just to save tigers, but will help look at sustainable development, protecting watersheds, looking at carbon storage in these areas." But moving the Global Tiger Recovery Program forward requires money. Pledges of $100 million from the World Bank and $85 million from WWF were announced at the summit. But more is needed to cover the $350 million price tag for the first five years of the 12-year initiative. Keshav Varma, program director for the Global Tiger Initiative at the World Bank, says bank funds will target wildlife conservation in South Asia with hopes of building a strong regional crime-fighting institution. "It would create data, would share information and would also bring good forensic and other technical science into it." Varma would also to see international organizations like Interpol, the United Nations Office on Drugs and Crime and the Convention on International Trade in Endangered Species join the World Bank to coordinate law enforcement in hot spots. Varma says tiger recovery presents a development opportunity, where ecosystems services that are often taken for granted - like clean water, forests and wildlife habitat - are also valued and protected. "I think that all the top leaders present in St. Petersburg talked about this equilibrium, this balance and to ensure that economic development should not be at the cost of natural wealth and eco-development." The tiger summit ended with a sense of optimism. Barney Long with WWF says it is now up to the world community to build on the momentum. "With enough space, prey and protection," he says, "the tiger can survive."